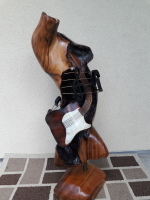 "Some of my favorite wood sculptures"
Groupie: To capture the rock n roll in all of us, Tom added a Koa wood carving that electrifies with her guitar to his female torso collection. 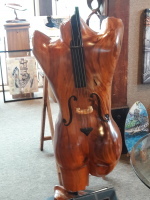 She is the third wood sculpture in Tom's musical inspired female torso series....can you find the other girls? 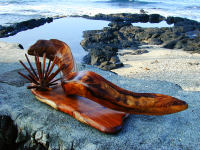 A Koa wood turtle seemingly in flight, a wood carving of an eel slivering up to slate pencil urchin these are the feel of movement Tom loves portraying with his wood sculptures. Once he sees something underwater he can't wait to share! Living in Hawaii teaches one respect for the island and all she has to offer, both above and below the ocean. Experiencing the Queen Liliuokalani Canoe Race inspired Tom's wood sculpture of The Paddler. Strength and dedication that cannot be described. 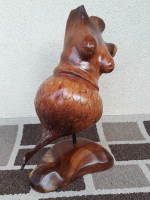 ​Barnicle Betty, Tom's whimsical wood carved mermaid will make any old salty dog smile. She's got character, charm, and a couple of well placed "barnicles". Tom said he couldn't stop smiling the entire time he carved her. 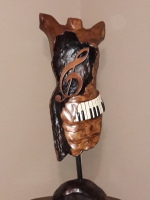 Tom's favorite wood carvings are a collection of everything from wood turtles to wood sculptures commerating special events for family and friends. 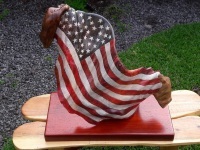 Read a little of the back story that inspired some of these particular wood carvings.